EPDS AP Ration card status enquiry and download online from here. 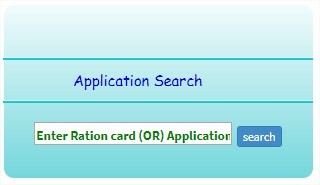 Here we cover about search ap ration card details by name and details of information on how to download ration card online. Every state provides advantages, benefits, services and also solutions to the Status Enquiry to their Rashan card Holders. Follow the article carefully to know all the details mentioned and download Andhra Pradesh EPDS AP Ration card. Check out the application forms of Andhra pradesh: Attached list of application forms. The people of Andhra Pradesh who need to Download or Print their Ration card has to follow the below steps carefully. Visit the official website of the AP’s Public Distribution System. Click here https://epdsap.ap.gov.in/epdsAP/epds to visit the site. In the homepage, you will find “Print Ration card” in the last Column. Enter the Ration card number in the textbox column and click “Print”. Then the ration card is displayed on the following page for reference. AP Ration Card Download is started automatically or you can press “CTRL+P” to print or download it. The downloaded copy is not original as it is a copy of the original one. As shown in the above image you have to enter details in the column quoting “Enter Ration card Number” in the image. Just enter the Rashan card number and click “Search” to view your card. For the EPDSAP applicants who had applied for a new ration card or who had applied for modification of existing Rashan card can check the status Enquiry of the application or Ration card from the official website itself. Follow the below steps to know the AP status Enquiry of your Ration card. Visit the official AP’s PDS website using the link mentioned in the above section of the article. As shown in the image above, enter the Ration card number or Application number in the field to check the status online. Then click “Search” to view your application status. The status Enquiry of your application for Andhra Pradesh EPDS AP Rashan card will be displayed on the following page. In the cases of Data Corrections, you have to apply for the modified ration card either by the Online method or by the Offline method. In both methods, you have to fill an application form to apply for Data Corrections. Online method of applying for the Andhra Pradesh Correction of the data of the Ration card is well explained in the steps below. Visit the MeeSeva official website of AP and then obtain the Data Correction form from the website. Click here https://ap.meeseva.gov.in/RationCard-DataCorrectionsApplicationForm.pdf to directly download the Data Corrections form. Fill in all the Applicant details in the form. Followed by the corrections needed to modify the Ration card. Then fill in the details of the member whose details are to be modified in the existing ration card. The Addition of members to the ration card is mandatory for every household as the Rashan of subsidies released is according to the Household data listed on the Rashan card. Visit the official website of MeeSeva of AP government. Then download the application for member addition from the website portal. Click here https://www.ap.gov.in/wp-content/uploads/2016/04/Ration-Card-Member-AdditionBirth-Application-Form.pdf to download the Addition form directly. Fill in all the required details in the member addition from with correct information. Then fill in the informant details with existing Ration card number for future verifications. Attach the documents such as a Birth certificate or Marriage and Member deletion certificate as proofs. The procedure of member addition both Online and Offline are identical in most of the ways excepting for the submission of the documents.